Emphasizing on India’s commitment towards conserving the big cat, Environment Minister Jairam Ramesh announced at the WWF-India event to introduce Youth Tiger Ambassadors, the addition of eight new Tiger Reserves to the existing 39 Tiger Reserves in the country within the next 6 to 8 months. These will be one each at Satyamangala in Tamil Nadu, Ratapani in Madhya Pradesh, Sonapeda in Orissa, the Biliriranga Hills near Mysore in Karnataka and two new Tiger Reserves each in Maharashtra and Uttar Pradesh. These will be Nave Goan Nagzira and Bor and Pilibhit and Suhelwa respectively. Adding to the introduction of the Youth Tiger Ambassadors, the Minister said while other talk of saving the tigers, we actually save the tigers! India harbors a large proportion of the world’s tiger population and the nation has been committed to make all efforts to conserve wild tigers and their habitats. The Minister elaborated this by further added that, “Our commitment to put the tiger on an assured course of recovery goes back 37 years when India launched the worlds most extensive and intensive tiger conservation programme – Project Tiger. The Minister also shared details about the recent loss of 3 tigers, 2 in Kaziranga where one tiger lost in a fight with a buffalo and the third tiger which died in Pilibhit due to in-fighting. At the same time, he gave the good news that 5 tigers cubs were born in Pench. Talking about the more promising areas for tigers, Jairam Ramesh pointed Kaziranga as one of them. Though known as a Rhinoceros habitat, today it has the highest tiger density in India. Kaziranga has 35 tigers per 100 sq. km. The Minister also informed that the fresh tiger census will be released in about two week’s time. Sharing further the efforts the Ministry has been making to improve tiger situation in the country, Jairam Ramesh discussed important steps which include increase in allowance of ground staff in Tiger Reserves, more funds from Finance Ministry for voluntary relocation of families from core area of Tiger Reserves, decentralization of National Tiger Conservation Authority (NTCA) and partnership of local tribal and non-tribal people in the act of tiger conservation. Referring to tourism, the Minister appealed for sustainable tourism wherein the money earned by tourism is used for local communities and development. 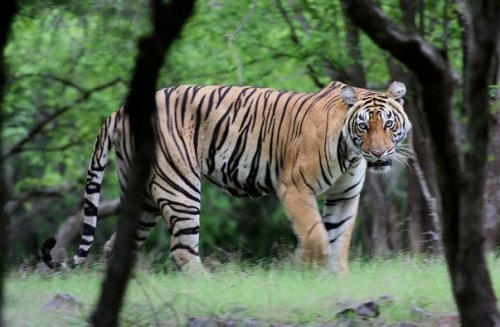 With this, there is some more hope for the Indian tiger and for the future of not just the big cat, but with it, the future of our forests and of mankind for times to come.